Hello there! How's your Christmas so far? The moment this entry will go live, I will be in the province on vacation mode. I just want to make sure I greet you, my readers and followers a very merry Christmas. I pray that the love of Jesus will dwell in your hearts and homes as we commemorate His humble birth being the true meaning of the season. This year has been fabulous. A lot of good things and memorable events happened. As we welcome the new year, I hope that we are able to start with a clean slate, forgetting all the bad vibes and staying positive for the upcoming year. Let's all have a prosperous 2015. God bless, everyone! This red lace dress is one of my sewing projects for the last quarter of the year. My elder daughter has a couple of red dresses already, so I thought I'd create something similar for my baby daughter to wear. Lately, I've been shopping for clothes in the same color or style, trying to dress them like twins. I sometimes also join the matchy-matchy ensemble as to avoid us looking like a festival of colors as we head out for a stroll or attend church. I thought it's nice to look at a family in the same shade of color or identical clothing. I used a shiny fabric for the bodice and lace for the lower part of the dress. Noticed something wrong with the back? Oh yeah, I had a hard time with the zipper closure. Red is not the best color for her, but I think she loves it. The truth is, I completed this project in October just in time for the Halloween. She dressed as Little Red Riding Hood with a white apron, red cape with hood and a basket. In this photo though, she traded her picnic basket to one of her playmates with a cute pumpkin bucket. I can feel that I am getting better and better in every sewing project which I accomplish. I feel proud that even without proper training, I am able to create something and save money over costumes or fancy dresses. Next time, I will be sharing another project on refashion. Till then. Happy holidays to you all! I almost forgot to blog about this. The weather in Baguio is very nice from the month of December to February so I thought I'd publish this entry now for those who are planning to go up north to celebrate the holiday season. As you know, we went Baguio to unwind and feel the cool breeze of the City of Pines just last month. If you guys missed my entry on our last Baguio trip, you can read it here. We stayed at Microtel by Wyndham for a couple of nights and so this is my short review of the hotel. Microtel follows the Victorian exterior design. The blue paint looks so cool. I love it. Took this photo of my elder daughter at the hotel lobby. Normally, there's only one person at the front desk so this place can get crowded during check-in and check-out time. 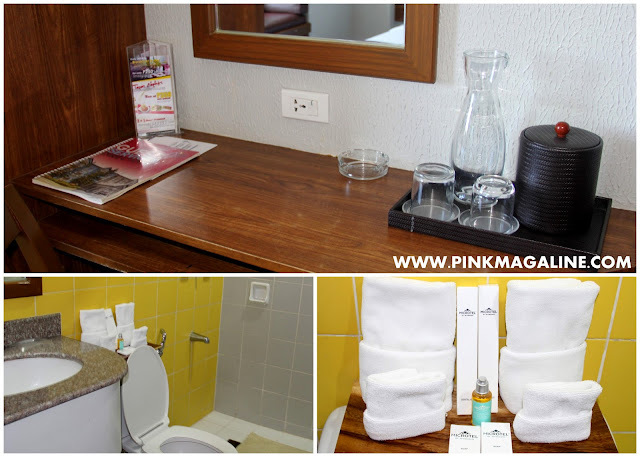 We got a queen double room for P3,800 per night with buffet breakfast for 2. Kids who are 5 years old and below are free of charge. Amenities for this room include a cable TV, electronic-key card entry system, radio clock, toilet and shower with hot and cold water, and individually controlled aircon. This was the view from our hotel window. Microtel Baguio is located at the heart of the city so it is pretty much near to everything. There are just a few things that I don't like about this hotel. I understand they don't charge a lot per night, but why the does the cable TV needs to be crappy? And, why no fridge? Good thing they have free water and unlimited coffee to those coffee addicts (not me) at the hallway near the stairs. I suggest book Microtel if you are in a minimal budget. They have rooms for families and couples on the go. If you are a tourist using the Victory Liner bus, staying in the hotel is perfect 'cause it's just a foot away. Use the buffet breakfast to your advantage by going there during the last 2 hours of mealtime. Their menu is normally composed of soup, salad, bread and spreads, rice and viands. Cancel your plan of having lunch outside and get a filling brunch at the hotel's restaurant instead. Will I ever book Microtel Baguio again? Maybe. Season's greetings! I thought I should try to make a Christmas-themed bento. I did this on the first week of December for my elder daughter's lunch, and of course, it is as simple as it gets and a quick one. What I used for this bento is basically steamed rice with corn, spam, and some fresh veggie slices. I used a pinetree-shaped cookie cutter and a tiny star cutter for the spam. The bits of corn rice looks like snow. (milk candy) on the side. Oppss! I am not done with my DIY Christmas ornaments yet. Don't worry though, this is going to be the last for this year. I promise. So, I made yarn Christmas balls and some glue snowflakes. I already blogged about them. Follow those links in my previous sentence if you wish to learn and add extra fun to your tree this year. Now let's talk about how I created this Christmas stocking ornament. First thing to do is create a stocking pattern out of cardboard. Lay the pattern to the felt fabric and cut multiple stockings out of it. Cut the gold ribbon, following the same width of the stocking. Sew it around to 2 felt stockings together. Sew some bead design to the stocking. I chose the star design because it's simple. Glue the strings beads right below the ribbon, attach a thread using needle for hanging and its done. The morning after I hung these stockings, people in the house recognized the difference and gave me compliments. Honestly, I love how it turned out. Wish I can make more stuff to beautify our tree, but we're already busy and it's already Christmas in a few days. I guess I'll have to save the rest of my creative juices for next year. A couple of Sundays ago was my elder daughter's Primary Sacrament Presentation. That morning, I woke up earlier than usual to prepare breakfast and cook lunch in advance. When my baby daughter rose from bed, I was only halfway done with the food so hubby took care of her. Thanks, babe, I really appreciate it. So, firstborn was so excited participate in the sacrament presentation, saying her line in front of the congregation and singing the hymns that the sisters in the primary arranged for them to sing. After the service, we went to our respective Sunday school classes, then managed to took some photos before going home. The girls all look so pretty in pink. Some of them will move to the Young Women's organization soon. Oh yeah, I mean them taller ones at the back. Here they are together with the ward's primary leaders and teachers. Now, this is me and my lovely girls in our Sunday best. She wore the crochet shrug I bought during our last trip to Baguio over a pink lace dress. I curled her hair for this special day. And the little one wore..
the dress I made for her that was featured here. This year's theme for the sacrament presentation is 'Families are Forever'. For my daughter who is only 6 year old, I know she doesn't fully understand what does it really mean. But, for me, it means that I can be with my own family in heaven. Life here on earth is called temporal life, while our ultimate goal is to gain celestial life. What do you normally do on Sundays? Do you go to church? Are there church activities that your or your kids particularly enjoy? Share, please. I just attended the best blogger Christmas party. As you can tell or if you are an old reader of my site, I stopped attending blogger events after giving birth to my baby daughter and focused on being a full-time mom, running the household, breastfeeding and stuff, but stayed active in blogging and social media all through this time. One of the blogger groups in Facebook to which I belong, Mommy Bloggers Philippines, held its first Christmas party at Spaces by Babyland and it was a super fun-filled one. Being with fellow mommies who enjoy doing the same things as you do is absolutely pleasurable. We took lots of photos, did a lot of chika, laughed all our lungs out, and all. Most of us wore white and blue in different shades. Can you guess the theme? Oh yeah, it's winter wonderland, baby! Beat that?! Haha!! Kidding. The caterers were impressive, most specially, Love Desserts which was my favorite. I tell you, I gotta stop myself after a slice of the rainbow cake, a couple of tiny cheesecakes, and a coconut macaroon. For the record, I didn't dive into the ocean of cakes and pastries first. I had a serving of lasagna (sorry no photo) and a yummy bite of this sweet ham, a perfect dish for the holiday season. I also tried the cocktail corner of Posh Caterer. Other than that, there was a spread prepared by Shekinah Dishes and Kubiertos Catering. They were all delicious. Another mom blogger, Paulline Joy Flores, got to take home the Sharp LED TV. Everybody was jealous of her awesome loot. Congratulations to her, too! The rest of the mommies got to take home items from Glorietta, The Cream Factory, Nature Essentials and Renuzit. 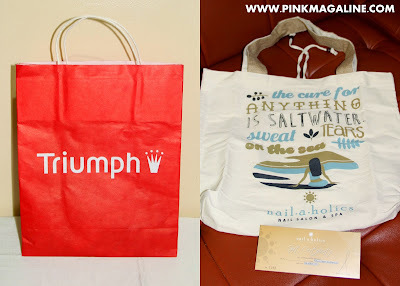 By the end of the party, everyone's hands were full, carrying loot bags from other sponsors like Triumph and Nailaholics. Fly Ace gave away a set of these products to each mommy: Jolly Garbanzos, Good Life Egg Noodles, Jolly Pineapple Chunks, and Doña Elena Al Dente Lasagna. As pasalubong for the ones at home, we received a Trolli bag with candies and gummies. There were items from Teleserv, Zomato, and Lazada as well. Sorry no photo 'cause this entry is already loaded. Again, it was the most wonderful blogger party I attended. 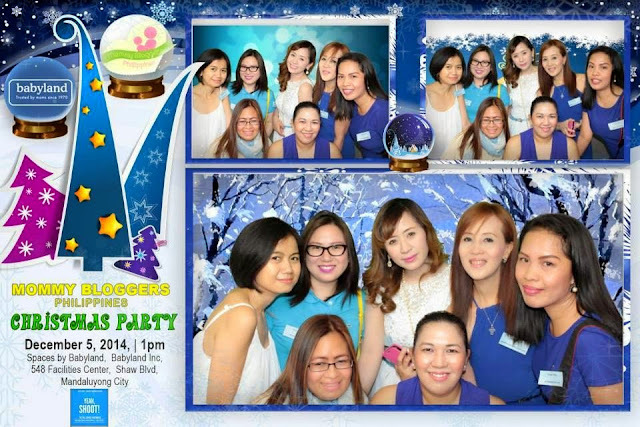 I truly salute the mommies behind Mommy Bloggers Philippines for a good job well done. 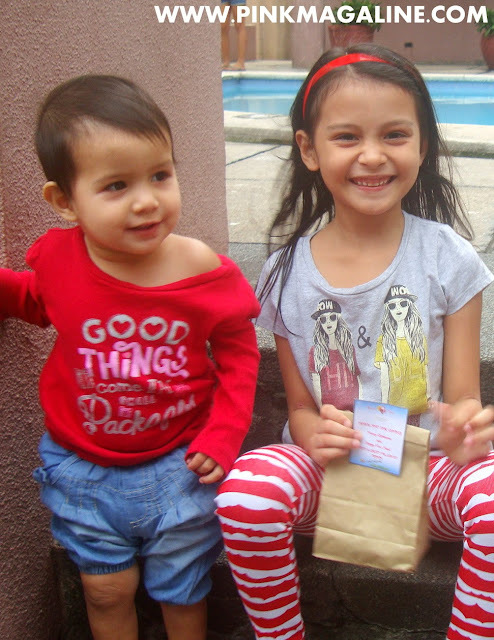 Thank you Mommy Lanie of TweenselMom.Com, Joy of JoyGurtiza.Com and Louisa of ArtOfBeingAMom.Com. Looking forward for another fruitful year with you ladies. More events, projects, and workshops. God bless you and may the spirit of Christmas dwell in your hearts not just this season but throughout the year! I asked my elder daughter if she wants me to curl her hair for the sacrament meeting presentation and she said yes. You know, this is one of the best things that I love about having girls, aside from being able to dress them up, I also get to play with their hair. I tried curling her hair before using a different method. The result was tiny curls almost like Merida's in Brave. You can see it here. This time, I am using foam curlers and the result is medium curls. This curling technique is done without using heat or chemicals. However, the process needs to be overnight. You can either wash your hair and air dry it for a short while before curling or proceed with a previously washed hair then dampen it with water. I prefer the latter one for my daughter's thin hair. Brush the hair. Spray some water to dampen it. Separate a section and spray some more. Twirl the hair in a foam curler, twisting the ends of the curler to secure. Make it tight enough so the curls will form well. Repeat the same process to rest of hair. Go to bed. In the morning, start by carefully removing the curlers one by one. Comb it once and mist some hairspray to make it last longer.